Tan Check Joon is a seventh dan black belt holder, national examiner and international referee of World Taekwondo Federation (WTF). MasTaekwondo brings you details of his life dedicated to promote and diffuse Taekwondo. 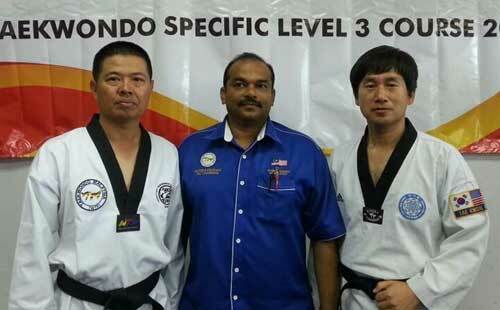 Tan (left) with the Taekwondo Malaysia TEC chairman Dhanaraj Rassiah (centre) and Kim from Korea during the recent taekwondo specific level III course in Kuala Lumpur. In a thorough report published by the Borneo Post, we get to know Tan´s tireless spirit to promote his passion. Taekwondo has become second nature to Tan Check Joon after decades of participation in the martial arts sport both as a competitor and instructor. The 7th dan black belter has built on this one passion of his life and though aware of the daunting challenges, he never gave up. “My struggle is to sustain my passion to ensure the survival of the sport and my martial arts academy,” the 46-year-old said. It hasn’t been easy but he knows what he wants — to help taekwondo maintain its dominance as a sport in the state. “I want to give back to this art (of self defense) I so dearly love. Sometimes, my thoughts are torn between being a business person and a martial artist,” said the national and international examiner of the World Taekwondo Federation (WTF). Tan started out slowly, turning his passion into a business philosophy and sticking to the concepts of earning, contributing and unifying. He said when he landed a corporate job and made some money, he would give his coaches and athletes the necessary support. “It’s my aim to provide full-time jobs with stable incomes to the coaches and talented or successful athletes who have moved beyond the competition age, and also help them further their studies for a good future. He said with the financial assistance from potential sports partners or his own company, he hoped to set up the first-ever Taekwondo (WTF) Scholarship for coaches or players who had represented the state in Sukma and the country in the SEA Games, Asian Games and other international meets. Tan knew deep down what he wanted to do, never regretting the choices he made in life. In fact, the reason he chose taekwondo was clear and simple – to teach others from the heart. “Teach them with passion and honesty about who I am and what I have achieved and the path I want taekwondo (WTF) to follow. “But the sport is not about me or what I have accomplished in my lifetime but about my students and the future of taekwondo,” he explained. 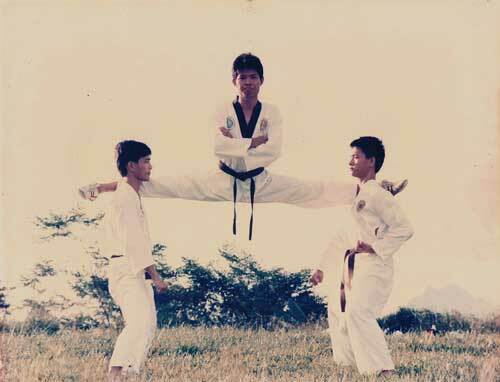 Tan stretches his legs over the shoulders of fellow trainees during his early years in taekwondo. As a coach, Tan groomed some 10 young exponents for national and international competitions between 1994 and 2000. Among them are Tan Chee Mian (World Youth Taekwondo Championship 1996 in Barcelona, Spain); Malcolm Yeo (Asian Games 1998 in Bangkok, Thailand); Roger Tan Yong Ping (Sea Games 1997 in Jakarta, Indonesia — bronze medallist, Asia Taekwondo Championship 1999 in Hong Kong); Chung Chuan Pin (Sea Games 1997 in Jakarta, Indonesia — silver medallist, World Taekwondo Championship 1997 in Hong Kong) and Robert Tan (Sea Games 1997 in Brunei — bronze medallist). To date, he has trained more than 10,000 martial arts exponents. Taekwondo has been Tan’s passion for the past 34 years. At first, he was attracted to athletics. He took up sprinting and represented SMK Green Road in the Inter-School Meet, and Kuching in the Inter- Division Competition, and was champion in 100M and 200M in 1985. His good performances earned him a berth in the state team for the MSSM Athletics Championship in Penang. After the Championship, he gave up athletics, realizing as a runner, he couldn’t go much further due to his relatively small physique. Tan began taking taekwondo lessons at 13 after discovering it was one of the most modern self-defense sports in Asia at the time. “The basic requirement is your weight. I was quite lucky to meet my first coach — he helped me master the rudiments. “Since then, I have grown to like taekwondo more than any other sports — I wouldn’t trade what I have learnt from the sport for anything,” said Tan who occasionally dabbles in golf. When he first started training, it didn’t take him long to learn that the practice and study of taekwondo was more than just a “fun thing” to do in his spare time. He said it took self-motivation, discipline and dedication to go far in the sport. Tan has come a long way, having been a taekwondo instructor for about 20 years. It’s under his guidance that WTF in Kuching and Samarahan Divisions has grown to become a popular and successful martial arts authority. Tan is a straightforward person with a reputation of being a tough and skilful martial arts exponent. His support for WTF and desire for everyone to experience taekwondo is immediately evident when one talks to him. He is humble about his achievements — and although spending most of his adult life developing WTF, he credits his instructors, members and parents for the success of taekwondo in Kuching, saying without their support, there would be no WTF. Tan performing a flying kick in the team exercise. He earned his diploma in fitness from Malaysia Association for Physical Education, and his sports science and fitness and national coaching sports science Level III certificate from the National Sports Council. He is now Sarawak Taekwondo Association (WTF) technical chairman and has been chief instructor-technical advisor for various taekwondo organisations both at divisional and state levels since 1993. He has been a state and national team athlete as well as a state Sukma coach. In taekwondo, he competed in the flyweight division and was the state champion in 1988, 1989, 1990 and 1992 and national champion in 1989, 1990 and 1992. He also won the silver medal in the Vietnam Taekwondo Open and the bronze medal in Southeast Asia Championship. Tan stopped competing at 26 to take up coaching. Later, he became an assistant instructor and while in that role, also prepared for his 1st black belt upgrading test. He began running his own training academy — Kuching Taekwondo & Self-Defence Academy (WTF) — in 1994 with 150 students initially. The students’ achievements gave him the most satisfaction, motivating him to do even better as a coach. He believed a good coach helped the athletes confront their fears and see where their true values lay. “A good coach usually believes in the players more than they believe in themselves. This is a reflection of the coach’s heart and attitude that enable him to help the players realise their true potential. “A good coach understands the personalities of the athletes. This way, he knows how best to help them. “A good coach also has a personal relationship with his team so that he can better understand the individual differences,” he added. “In today’s world, the values taught in martial arts are a cherished weapon against the negative influences our children face each day. “It’s the instructors and students in the classroom that give the sport life above and beyond the promises of what the style holds,” he said. Tan knows he still has a lot to contribute to taekwondo in many areas. Technically, he is confident of producing more champions for the state association. He thanked the association’s council committee and members for the trust, support and opportunity to lead the state technical board. Tan said WTF was granted recognition by International Olympic Committee (IOC) at the 83th General Session in Moscow in 1980. In 1992, taekwondo was a demonstration sport at the Barcelona Olympics with 128 competitors from over 30 nations in the fray. Taekwondo was made an official Olympic sport for the 2000 Sydney Games by 103th IOC Session in Paris in 1994. Tan said the origin of taekwondo was very old and came from a variety of sources through several modern day martial arts pioneers. 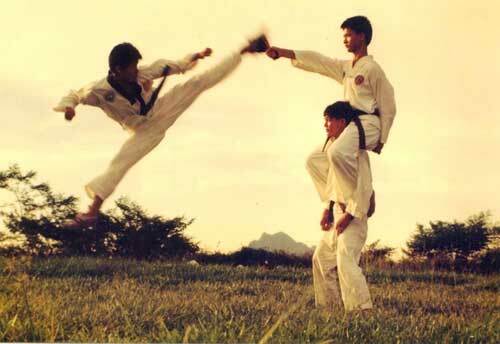 The modern version of taekwondo was officially named in 1955. Since then, the sport has continued to develop and grow with the establishment of official organizations and a central world headquarters in Seoul, South Korea.